Works really well in hand buff decks. You can just trade away some stuff and have a decent minion on board or just go face as a win condition. Do you know that this card says something else when played in aggro decks: "DON'T WORRY LOVES, THE CANCER IS HERE"
Everyone thinks that this card suits all aggro purposes, which it does but its ok in more 'midrangey' decks in classes which have some buffs like paladin. Actually Tracer says Don't worry "loves"
this card really should replace Southsea Deckhand for non aggro rogues. you often hero power - southsea deckhand on turn 3 if you don't have backstab anyway. Actually it's a lot better for hunters too. Harder to remove means you can maybe attack one more time with it while Wolfrider has zero chance surviving next turn. Also Divine Shield is pretty annoying. 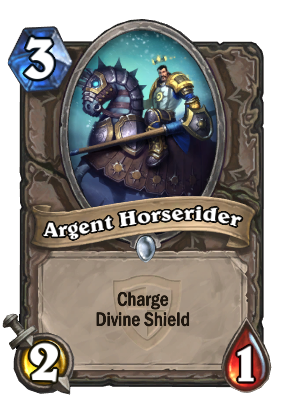 Nah, Argent Horserider is definitely better than Wolfrider. Since it has Divine Shield, it can actually survive hitting something and therefore can be used more effectively in the midgame to keep the board and do more damage overall. Divine Shield is worth a lot more than 1 atk, except in the most braindead of aggro decks, (which usually have a low winrate, anyway). The ability combination of Charge and Divine Shield makes this minion extrem valuable in aggro decks. You can go face and this minion will atleast take 2 attacks or spells befor dying or can trade off taunts without dying. I actually use it in my control warrior. I love it because it's great in ALL games. Whether I'm on defense or I am up against a super controler player like freeze mage or handlock. Whether I am behind and need to take out a 3/2 I normally don't have reach for (Paladin), or I'm ahead and I want to push forward with face damage but also want a sticky minion. So let me say, this is the silent Hero from this weeks brawl. This card gives me value 10/10 and is so versatile even lategame you find ways to use it. This reealy might be the best card from TGT after all Brode made it. DON'T WORRY LOVES, THE CAVALRY'S HERE! This is exactly why I came to this page.